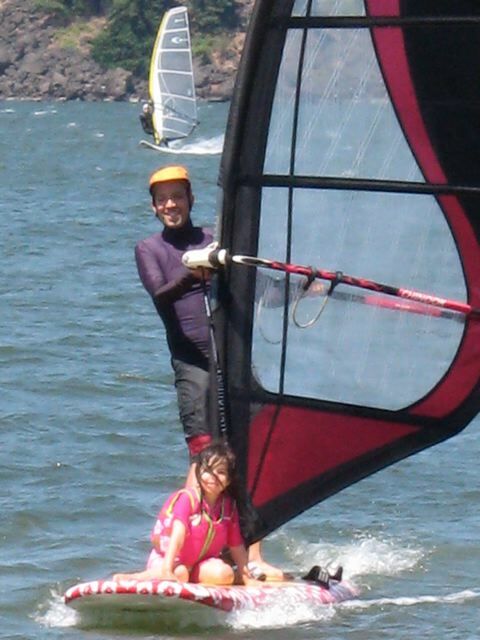 The daughter is now almost as tall as I am, but this is a favorite windsurfing snap. As I have shared, the proclamation of stoke is a dominant theme in these pages. I first came across this expression in a windsurfing blog. "I proclaim my stoke for all the blessings," the page read. The phrase resonated deeply with me, both as a general philosophy of humility and thankfulness, as well as a whoop of delight for a really excellent sport. With all my activities, relationships, crusades, few things give me such unmitigated joy as windsurfing the Columbia Gorge. Seeing such breathtaking panoramas and then playing in the wind and waves, skimming over the Columbia with speed and precision (some of the time), has been a high point of my life. As September comes to a close I realize this season's sailing may be over. Looking back I am happy to have continued to make progress with the sport. I had no expectation to improve my sailing, as I am 50 this year, but yet such occurred -- not because of any exotic diet or exercise regimen, but rather improved knowledge of how I sail and being able to dial in the gear to enhance my style. Lucky for me windsurfing is an arcane sport full of all sorts of metrics and tolerances which allows for much ruminating. Part of the fun of this summer was that I was able to sail longer periods of time without falling into the water, and was thus able to sail more often without a wetsuit. Please ignore that this was the hottest summer on record in Oregon, with more days in the triple digits than ever before. So perhaps my perception of sailing longer without falling and therefore not needing a wetsuit was merely a consequence of the higher temperatures. Perhaps the knowledge of self that I attribute to age could better be explained by gracious self-deception. To that I say, stoke!